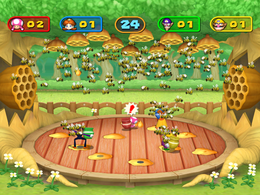 Big Dripper is a 4-player minigame that is found in Mario Party 7. Its name is a pun on the star constellation, the Big Dipper. Its gameplay is similar to that of Oil Panic, a game released for the Game & Watch. The four characters carrying their colored jars appeared standing near to puddles of honey drips. The hives at both sides quake as the bees fly out into the open space as all the players ducked to avoid the attack. The bees then fly back into their hives as the players stand up, believing that the area is safe. The minigame then starts. Four players are standing carrying empty jars are waiting to be filled with honey. The objective of the minigame is to collect the most drips of honey within the time limit of thirty seconds. The honey drips from the honeycombs on the ceiling; the players can notice the drips by seeing their shadows on the honey drip spots. The players must collect the drips before they land on the floor. Additionally, the hives residing at both of the sides occasionally rumble; signaling the players that the bees will fly out in the outdoors. The players have to duck to avoid being stunned by the mass of bees, or risk being stunned thus wasting a moment of time. At other times, they rumbling sensation from both of the hives would result of a false alarm, meaning that the bees would not fly out. The player with the most drips of honey collected when time runs out wins the minigame. If two or more players have the same amount of drips, those players win the minigame. However, if all players have the same amount of drips, it is considered a tie. The players line up with their pots in front of them. The winner(s) does their victory animation. Rules – "Collect the honey that drips from the ceiling, but watch for swarms of killer bees!" Advice 1 – "If the controller starts to shake, bees are on the way! Duck with and wait for them to leave!" Advice 2 – "If the Rumble Feature is turned off, you'll see a "!" on the screen when the bees are coming." This page was last edited on March 10, 2018, at 02:13.